Map of Panem - The Hunger Games. 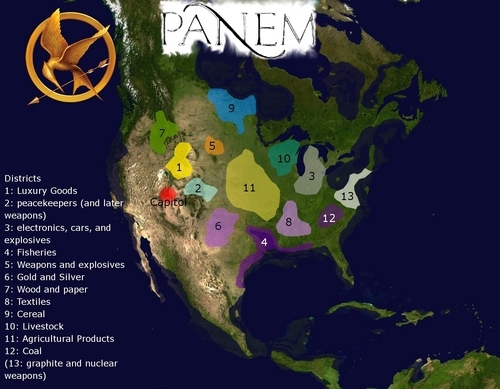 This is a map of Panem. HD Wallpaper and background images in the Hunger Games club tagged: the hunger games katniss icons peeta games the quotes map panem. 2 is masonry, but it is later reveald to make peacekeepers. 3 does not make cars or explosives, because cars are made in 6 and explosives are made by capitol scintestets. 5 makes power. 9 makes grain. and after the dark days, 13 is not a district but a society of its own. have you evan read the book?